"...the numbers tell a clear story; the demographics of America are changing in a way that is deadly for the Republican Party as it exists today. A GOP ice age is on the way. Demographic change is irritating to politicos, since it works on elections much as rigged dice do on a Las Vegas craps table: it is a game changer... In 1980, Latino voters cast about 2% of all votes. Last year it was 9%, and Obama won that Hispanic vote with a crushing 35-point margin. By 2030, the Latino share of the vote is likely to double. In Texas, the crucial buckle for the GOP's Electoral College belt, the No. 1 name for new male babies — many of whom will vote one day — is Jose. Young voters are another huge GOP problem. Obama won voters under 30 by a record 33 points. And the young voters of today, while certainly capable of changing their minds, do become all voters tomorrow." I have been hearing about the permanent realignment theory for years and have never been comfortable with it. Occasional commenter Superdestroyer has been an early advocate of this view, as exemplified in comments here as well as at The Moderate Voice and other blogs. To me it smacks of racism, and I find this notion of ethnicity as an absolute determinant of electoral destiny to be offensive. The explicit assumption is this: Since Latino's voted overwhelmingly Democratic in the last election, they will always vote Democratic. Moreover, minorities will always vote based predominantly on their race, and not as individuals. I just don't accept the premise. As a consequence, I was pretty dismissive of Superdestroyer when he did make an appearance here. Now I find his thesis is mainstream conventional wisdom. Who knew? "Americans are seemingly very reluctant to give true majorities to either party. Since FDR left the scene, Americans have given unified control to a party for four years or more only three times: 1949-52, 1961-66, and 2001-06 ... I don’t know if this is part of a conscious effort on the part of Americans to achieve divided government, or if governing America is an impossible task, such that the President’s party always gets punished. There’s certainly a strong argument for the latter – after all, no President since Teddy Roosevelt has left office with more Congressmen of his own party than he had the day he entered office. Regardless of the cause, the fact that unified government is so rare should give further pause to those who expect our current arrangement in Washington to survive for an extended period." "Young voters need to see a GOP that is more socially libertarian, particularly toward gay rights... Latinos need to see a quick end to the Republican congressional jihad on immigration... the GOP should support practical immigration reform that includes a path to citizenship." Reasonable arguments and sensible advice. This approach, combined with common sense fiscal responsibility ( Like the rhetoric that Obama ran on in the campaign, but has now been completely abandoned by the President and the Democratic party) should appeal to any rational voter - regardless of skin color or ethnic identity. Technorati tags: Democratic , 2010 election, Divided Government, Republican, demographics, latino. UPDATED: 04-July-09 Added links and fixed typos. IF the Republicans support the open borders and unlimited immigration policies of amnesty, they will face millions of more automatic Democratic voters who will support higher taxes, bigger government, and a more meddling nanny state. Also, how can the Republicans compete against a Democratic Party that tells blacks and Hispanics that the Democrats will tax whites and give the money to them. If opposing the idea is called racist. If you really believe that people want divided government, then why has Mass., Maryland, Chicago, DC been one party states for decades? IN reality, as the U.S. becomes a one party state, there will be more variation in government because the blue dog Democrats and moderates will no longer feel the need to tolerate the insanity of such groups as the Black Congressional Caucus. The premise to your statement is incorrect. No one is calling for "open borders and unlimited immigration". No Republicans, No Democrats, No Conservatives, No Liberals, No Moderates. No one supports that. Well, maybe a few extreme anarcho-libertarians. Other than that, no one. That makes your premise false, your argument a straw-man fallacy and the dependent clause irrelevant. What Michael Murphy suggests in the linked column is that "the GOP should support practical immigration reform that includes a path to citizenship." - a very different thing, and a sound recommendation. The Democratic Party does not say that. The Democratic Party does seem to support a policy of taxing individuals, job creators, entrepreneurs, and businesses of all kinds for every possible reason they can think of, in order to control and redistribute that money to any constituency that they think will help them stay in power. The largest constituency that benefits most from this are probably middle class whites. 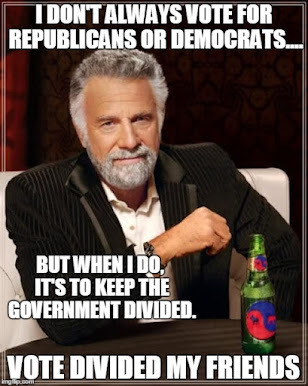 There is an argument to be made that is similar to yours, that when there are more net consumers of government largess (regardless of race) than there are net producers of the revenue taxed to support them (regardless of race), you cross the Rubicon to socialism, as the tax consumers can always outvote the tax contributors. In that context, I think it is fair to accuse the Democrats of pandering to net tax consumers (regardless of race) in a conscious effort to keep themselves in power. However, when you express this argument in purely racial terms, which is demonstrably false (Americans of color pay taxes as well as whites), your argument is racist by definition. Where to start? 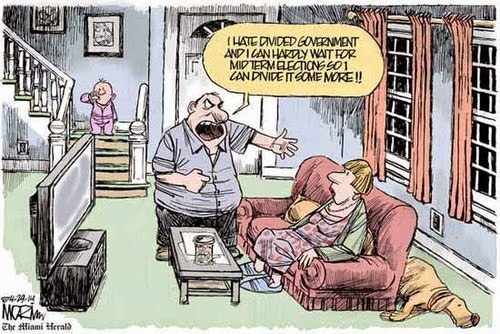 First of all, I do not argue that people want divided government. I don't know whether they do or not. I argue that people who support the objectives of fiscal responsibility, spending restraint, and limited federal government should want and should vote consistently for divided government. This blog advocates for a voting heuristic that would permit a minority of unrepresented voters who believe in those objectives to have a much larger impact on our federal government than they do now. Next, a city government is not the same as the federal government. A state government is not the same as the federal government. Neither a city charter, nor a state constitution is the same as the United States Constitution. Our Constitution was designed to enshrine argument and divide government through checks and balances. I'll concede that our constitutional protections are severely undermined by episodes of One Party Rule (both the R and D flavors), but at this point I am still betting on those protections, particularly if 5% - 10% of like minded voters of good conscience start voting specifically and consciously for divided government to defend those Constitutional checks and balances. I could be proven wrong. Actually, except for the presumption of the inevitability of an indefinate one party state, I'll agree with you on this last point, and leave it at that. The current Democratic immigration proposal is defacto open borders. If you get to the U.S., you get to stay. If you get to the U.S. you qualify for government services and all the benefits of the welfare state. The Democrats will never enforce the rules at the borders and will never develop effective rules to limit identity theft and employer control. Any employer verification will be too close to profiling and that the Democrats will never tolerate. One of the reasons that the Democrats support open borders is that not only produces future automatic Democratic voters but it produces a large demand for government services and thus more government employees. If you really want a group of moderates to be able to elect more Republicans and Democrats, then you have to support closed borders and very limited immigration. Anything else ensures the growing dominance of the Democratic Party. Also, corruption is going to start increasing in the U.S. As the U.S. becomes a very diverse place, corruption will replace political organizing or voting. When nothing can be changed at the ballot box and government spending cannot be controlled, people will find ways to stop giving their money to the state.